You may recognise this fabric – it’s been the banner feature of this little web space since I started blogging, and was also the subject of one of the first jackets I wrote about, which was made to wear to my best friends wedding. After the first jacket I had a scant 1.4m of 130mm wide fabric plus two large scraps, and there is quite literally nothing of it left now! I almost had to piece together the last pocket to make it work. Typically, if I want to get a compliment out of my beloved, it’s not enough to go fishing for one – I have to go in there with a speargun (obviously by which point any nice words extracted are null and void). So when hubby did both a physical double take on me in this jacket – then blurted out how much more amaazinger it was than Octopus the First, well – it was nothing if not completely satisfying! In other, completely unrelated news – I’ve finally found a hair dresser I LOVE. 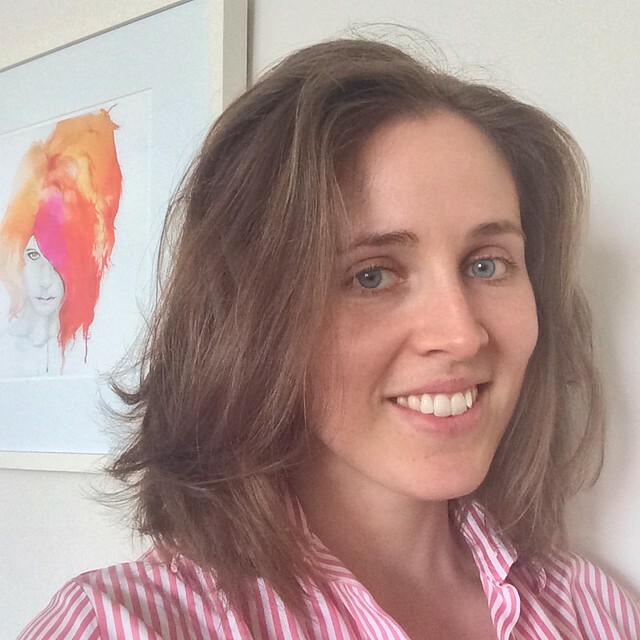 I’ve never worn my hair down so much before in my life – and I’ve always judged a hairdresser by how good the cut looks after you’ve washed all the styling out. This is it air-dryed and zero-product – zero maintenance. True to form, I’ll probably keep having it cut like this for the next 35 years. The pattern is trusty Vogue 7975, with the sleeve from Marfy 9814 – a 3/4 delight with a little flounce on the end. This sleeve piece screams Chanel to me, as it’s very reminiscent of the styling I’ve been seeing in their recent collections. It’s also, I think, ridiculously flattering. Paired with the classic bodice of Vogue 7975 – becomes a 1 + 1 = 3 kind of synergy. 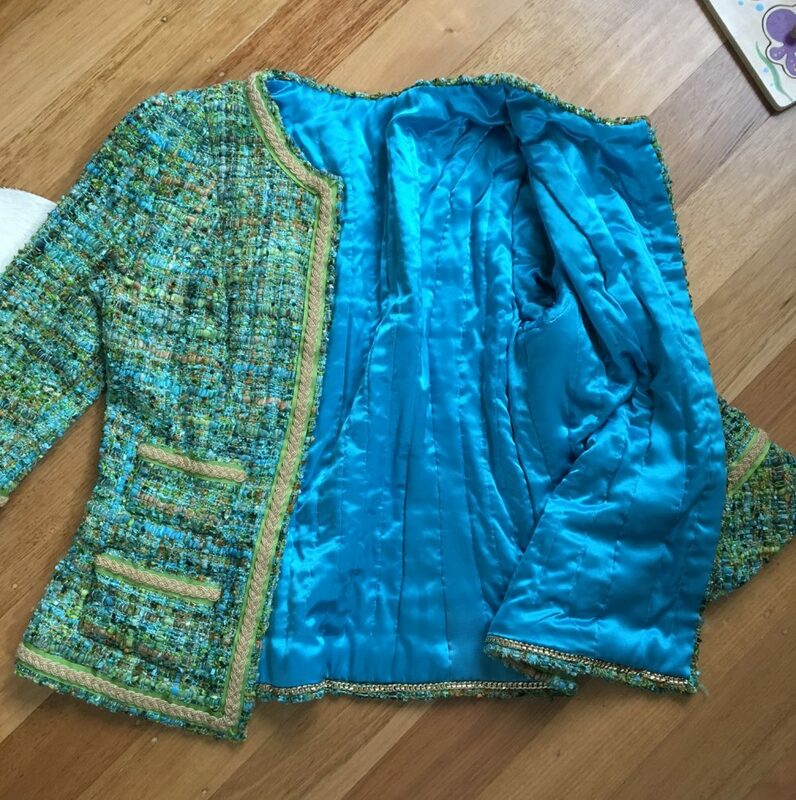 The fabric is a silk boucle, lined in turquoise charmuese (from Stitches to Style). The trim is a chartruese grosgrain ribbon from Jimmy’s Buttons which has been painstakingly cut down to the width I wanted (I could only get it in a wider width) – paired with a vintage Chanel trim Susan Khalje bought in Paris then lugged all the way to Melbourne as a potential option for her students to buy in her 2017 Tour of Australia. It was a particularly long length, and I get super excited when I spot the other ladies who bought some – sisterhood of the trim! Sewing it on made my hands smell like a hessian bag. The grosgrain was a nightmare to deal with – not nearly as well behaved as lovely petersham. In the end, having it split in two was a godsend come the time to sew it in curving around the neckline – there ended up being a good 2cm difference in length of the inner to the outer ribbon just around that section. Cut in half, basted back together at the right width, then sewn on with tiny stitches in a matching thread. I still haven’t found buttons for this yet, and I’ll probably just not bother. I very nearly almost didn’t even put pockets on… then went the whole hog with 4 because I figured the fabric was busy enough, why not just keep with that. There’s nothing new or groundbreaking here that I haven’t covered in the copious posts I did on my first French Jacket back in 2013. Oh, except maybe that the sleeve flounce is on the bias – I did elongate the flounce by an extra 1.5cm (at Susan’s recommendation, and thus shortened the sleeve by this amount also to maintain the length) to ensure that I could get enough of the grid repeat of the fabric shown off. 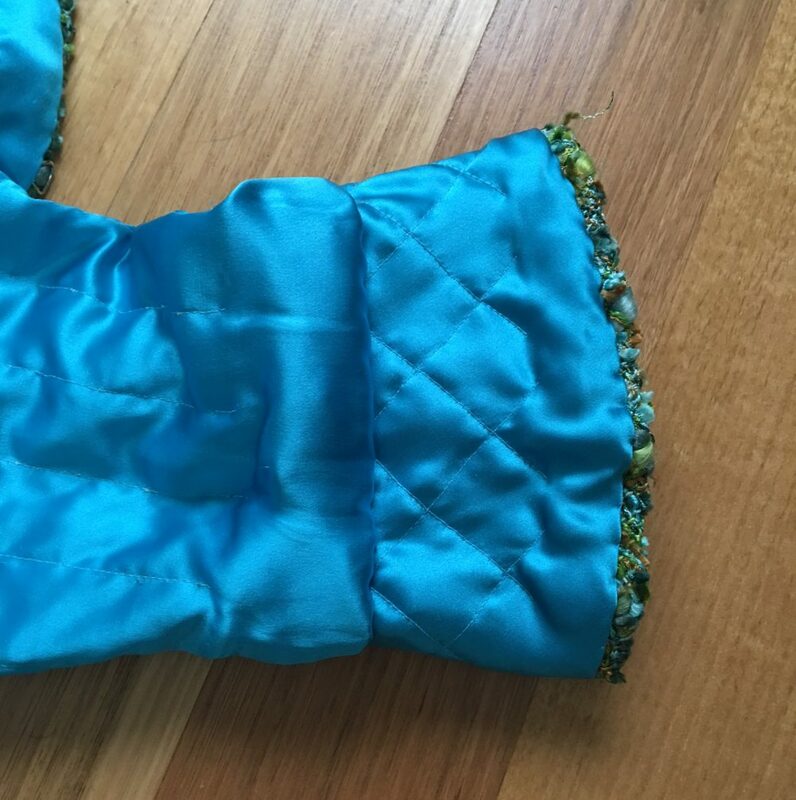 I quilted this on the bias as well – along with some extra underlining in the way of silk organza, this really helped the flounce to hold its gentle conical shape whilst being worn. 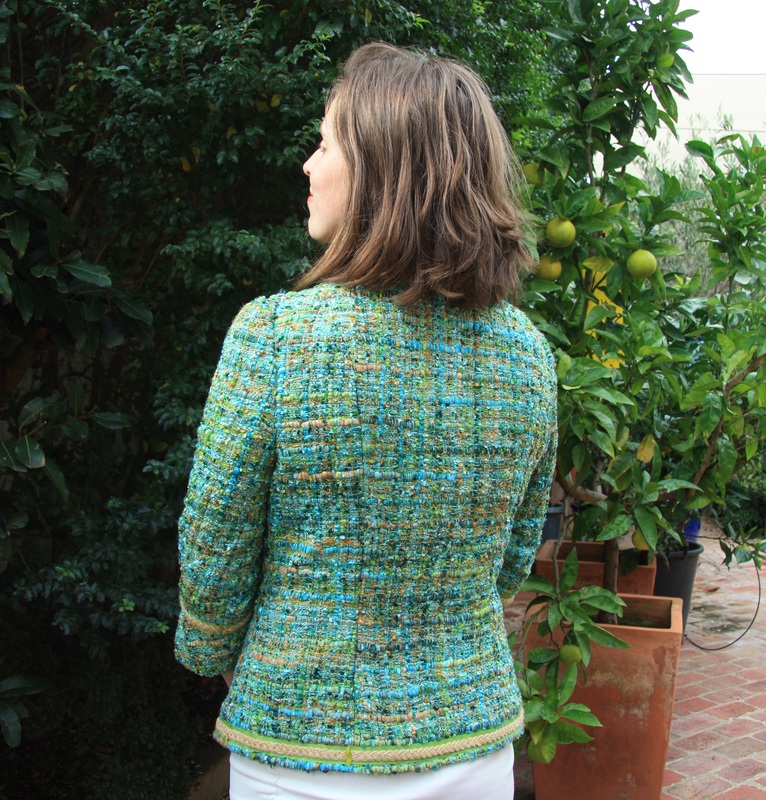 I recall recording the amount of time I spent sewing my first French Jacket – around the 150 hour mark? Well if I had to guesstimate, this one took a little less – maybe closer to 120 hours all up. This includes making the muslin, the 5 full days I had whilst on the French Jacket course (I couldn’t make it to the whole 7 days), plus a half day prior for fitting and cutting out, plus time spent post-class sewing on trim and pockets. I’ll admit not having a 3 piece sleeve and vents reduced the total time, as well. Gorgeously stunning. I just love everything about this jacket. You’re too kind. 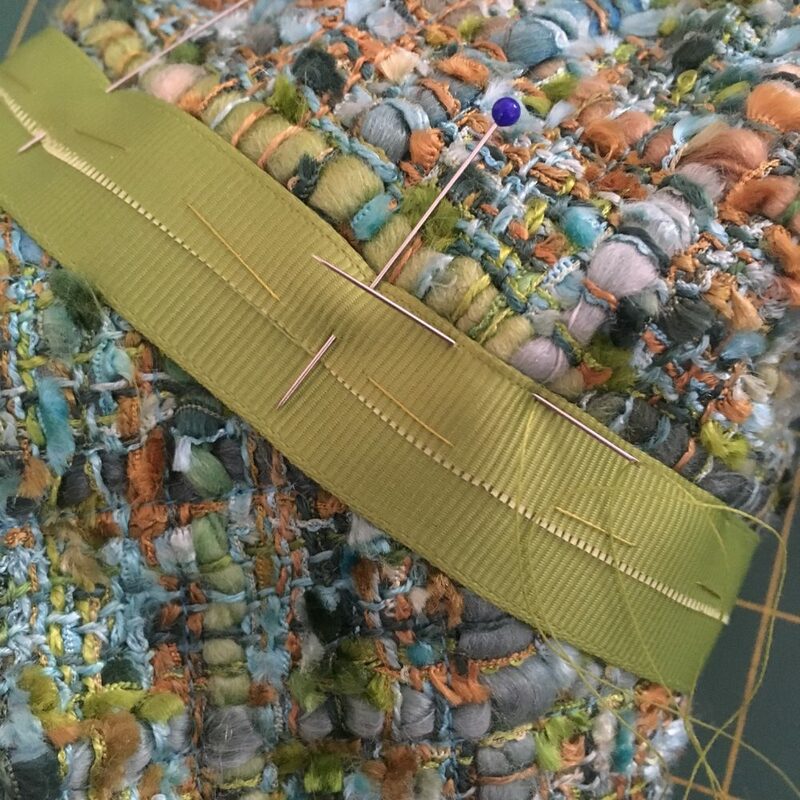 I love this sort of sewing so find the whole circus/process to be really enjoyable. Thanks! Love Chanel. Love this. I don’t think buttons are needed. The fabric and trim enhance each other. I’m not sure you can add more to it. What a wonderful seamstress you are! Love it! I am working on a muslin of this pattern right now so its nice to see a lovely finished garment! Wonderful detail work on this version. I love how you did the sleeve and good call on splitting the ribbon. There was no way that firm ribbon edge was going around the neckline without some work. I agree that buttons aren’t necessary. Thanks Mary! Yes, even with the split the ribbon still angles up somewhat around the collar. Probably the kind of thing only I would notice, but it would have definitely detracted had I not split it! I totally get the hesitation… it seems like SUCH a big project, especially when you haven’t done one before! But once you’re in… you’re hooked ;) Thanks Christy! Your jacket is more beautiful than any of the Chanel jackets I have seen in several years. Chanel puts a lot of embroidery on the haute couture but I like your trim and overall design better. Oh you’re far to kind, thank you Pamela! I’ve been struggling to find any real inspiration from the last few collections as well… I’d still like to try a fringe trim one day. It’s a tough thing to make work though! It’s perfect and worth every minute of labour. Thanks Ruth – I couldn’t agree more, totally worth it! Just amazing! What a magnificent jacket! So amazing! I love how the jacket fits you so perfectly. The fabric is beautiful. Well the fit is entirely due to Susan’s magic skills. But I’ll totally take credit for the fabric haha :) Thanks! Could I reblog this on my site? Everything about this jacket is utter perfection! Love the little sleeve flounce – I think that’s my favorite detail. Gorgeous!! Your smile says it all! This is beautiful and looks wonderful. I hadn’t even noticed it didn’t have buttons until you mentioned it, so maybe you don’t really need them. 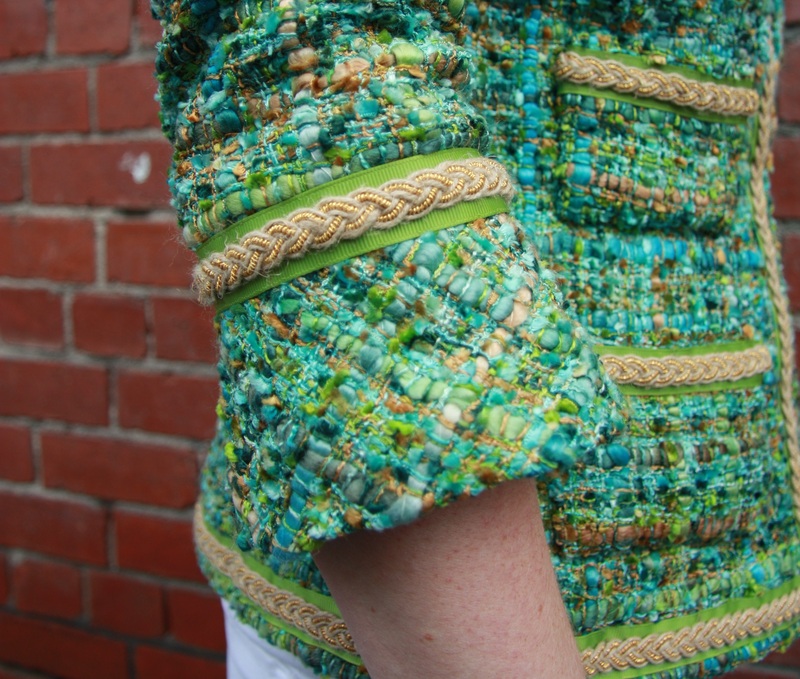 Also, the sleeve flounce takes this jacket up a notch! Well done! 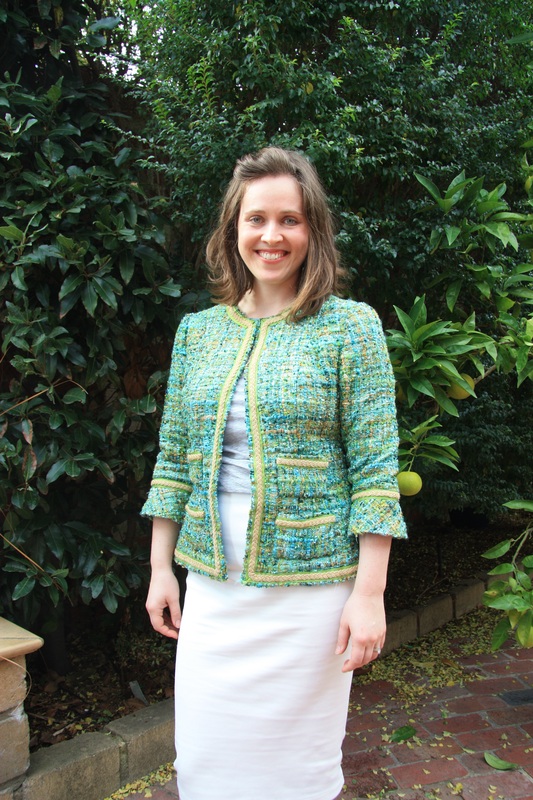 Beautiful Mel… you, your fabulous jacket & funky new fuss free hair. Stunning, the colour, fit and trim so perfect and husband’s comments would have been the icing on the cake. . They were, thanks Sharon! Looks like I’ll be seeing you at Mrs Weaver’s class in Melbourne early next year – very much looking forward to it! Ooh it’s fabulous! 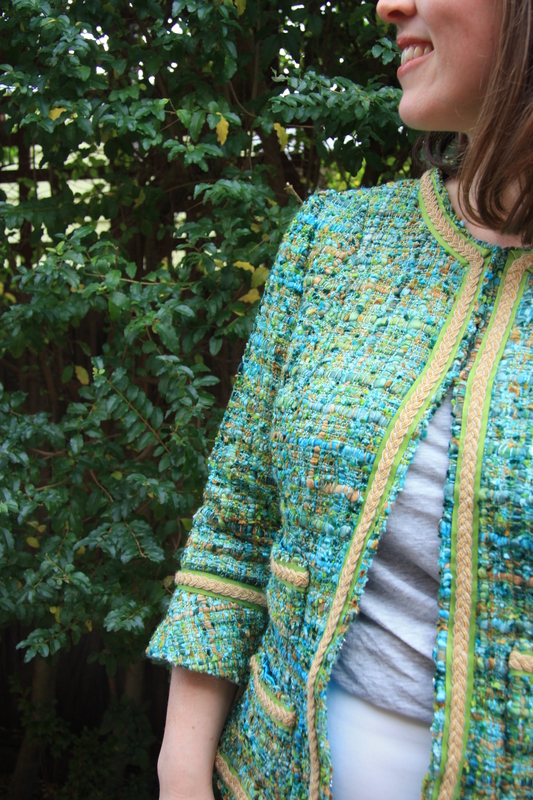 The trims look the perfect match and bring out all the colours in the tweed. It fits so perfectly too – awesome work! Thanks for posting this. 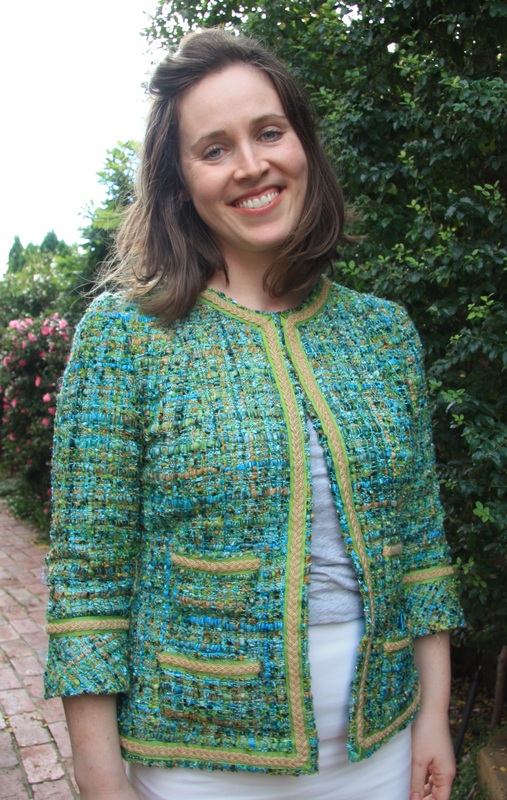 You have persuaded me to give a jacket like this a go (I’ve enrolled in the Craftsy class). I’d dismissed them before because all the fashion photos I’d seen of Chanel garments had flat chested models, so until I read your post I hadn’t thought the designs would work for me. Oh Fabulous! Don’t let the models discourage you – the princess seam setup of the Vogue 7975 can be worked to suit every body shape. I’ve even seen people add in a 3rd front panel to accommodate a large curve change between a big bust/small hip ratio and vice versa. 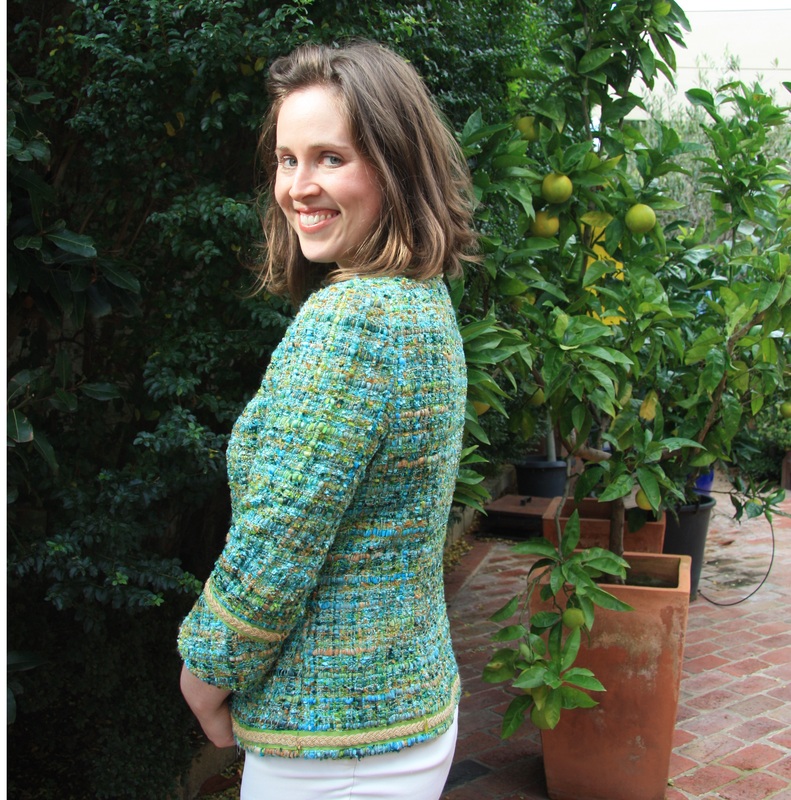 Enjoy the Craftsy Class – it’s a labour of love :) You may end up being surprised at how versatile such a garment is! I’m speechless! it’s jaw-dropping gorgeous! 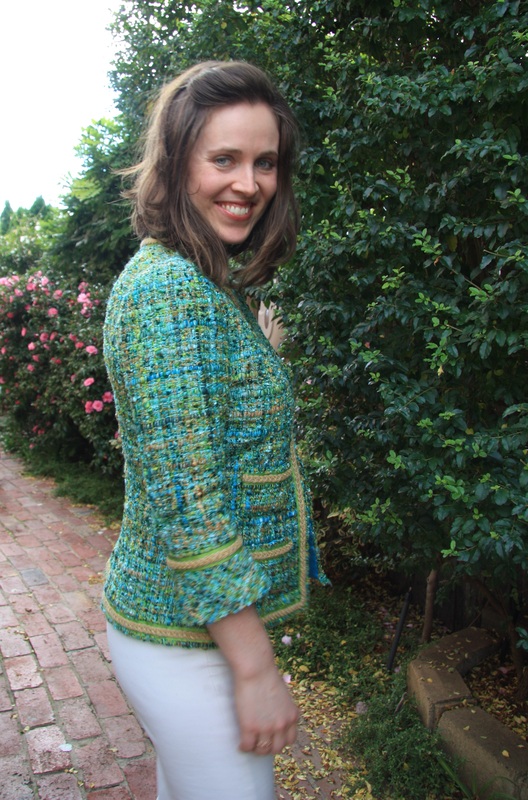 All of the hours you spent working on this jacket has paid off because it is beautiful and you look gorgeous in it! Love your haircut and love, love, love your jacket…well done! Wow what an amazing jacket. I love the green color on you. You did an excellent job! !